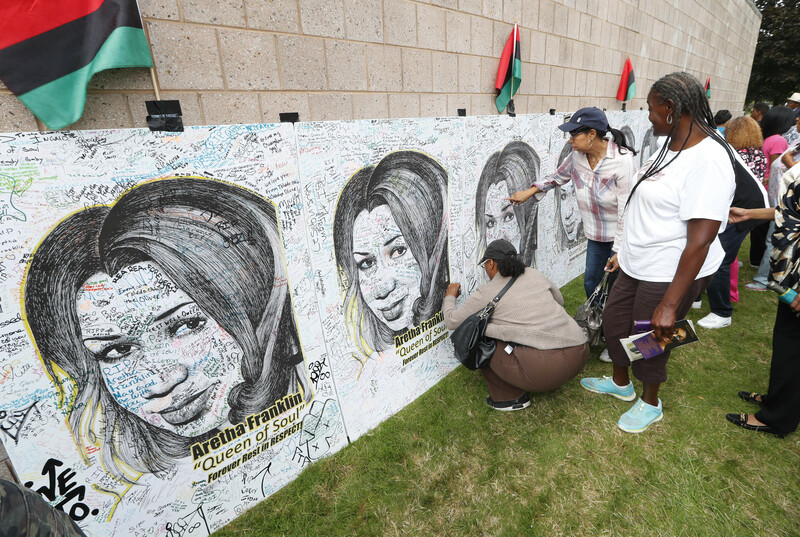 DETROIT — Mourners streamed in for a second day Wednesday to pay their respects to Aretha Franklin, who was dressed in a different outfit for her final public viewing, as if making a costume change during a show. The two-day viewing was part of a week of commemorations for the legend, who died Aug. 16 of pancreatic cancer. She was 76. Workers carefully moved Franklin’s polished bronze casket from the rotunda late Wednesday night and loaded it in to a 1940 Cadillac LaSalle hearse. Journalists from The Associated Press were allowed to document the casket’s movement after the public viewing concluded. A sold-out concert called “A People’s Tribute to the Queen” will be held tonight at Detroit’s Chene Park Detroit Amphitheatre. A marathon funeral with an all-star list of speakers and performers was scheduled for Friday. As they approached the casket and heaping displays of roses, many people smiled, cried, crossed themselves, bowed their heads or blew kisses.